Farmhouse, 3 bedrooms, all en-suite, large lounge, dining room, & kitchen. There is a choice of walking and mountain bike trails, pony trekking, while on the water there is fishing, canoeing, kayaking. Close by is La valle de la sur Soullevre where you can try bungie jumping if you’re brave enough. St. Lo. 8 kilometers north offers many places of interest. and is famous for its connection with horses, it boasts the internationally renowned Harras. Where in August are held many events, and for those requiring a more active pass time there is a pedalo hire outlet in the town centre on the river Vire. In the surrounding area at every turn there is an interesting farm or museum a cider maker or artisanal cheese maker. 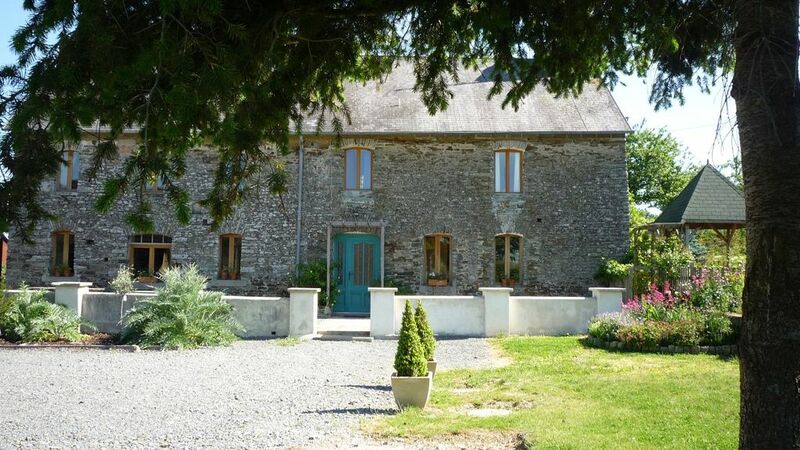 Set in the quiet verdant countryside of Normandie, this beautifully restored farmhouse has been furnished in a mixture of antique and modern styles. All the bedrooms feature en-suite bath and or hydro-massage shower rooms, whilst the designer kitchen again reflects the owners' great attention to detail. The garden with terraces to the front and back of the house, where guests can take advantage of the sunshine at any time of day. The conservatory and veranda overlooks the pretty fenced pond and rockery which is home to several carp and a favourite spot for relaxing. To the S.E. aspect of the garden there is a decked arbour, covered in grape vines and Wisteria, a real hot spot, and a Gazebo for cooling off in. Three minutes drive from Conde Sur Vire, bars, restaurants, kayak centre, where you can try your hand at rock wall climbing, crazy golf, or just messing about in boats. Horseriding, cycling/walking, fishing. 1hrs drive to D-Day beaches, Bayeux, Granville, Le Mont St Michel. Caen-great for shopping! and war memorials, St. Mere Eglisse 20 mins away, where they re-enact the tradgedy of the german parachutist who was caught on the church steeple in WW2. The whole area is steeped in history with innumerable chateaux and places of interest too numerous to mention. Just relax in the conservatory whilst you peruse the hundreds of leaflets of places of interest you can visit whilst quaffing a glass of wine with your loved ones, while you listen to the sounds of silence. Warning!!! bird song can interupt the silence sometimes. Our garden is a veritable sun trap at any time of day, as it charts its course from the east over the gravel garden (where a young weeping willow grows) to the west where the lawns are laid. There is a Gazebo in the gravel garden with built-in seats for those requiring protection from the sun. There is also, by way of description a veranda which is a covered decked area along side the pond, which is one of the coolest most relaxing places in the garden. Alternatively there is a shaded area under a line of Fir trees next to our vegetable garden. We supply tables, chairs, benches, barbeque. The lawned area to the west is an ideal place for setting out games or a paddling pool. A donkey is kept in a neigbouring field. We experience a wide variety of wild life at various times of the year, hares, butterflies, huming birds, frogs, toads that beep, dragon flies, a barn owl, jays, wrens, ptarmigan, its a naturalists paradise. Pets are welcome. The spacious dining room seats 10-15 people comfortably and is linked to the conservatory through French windows and overlooks the pond, where you can enjoy watching the multitude of wild birds, butterflies, dragonflies, and watch the fish jumping. From the conservatory you can enter the large well designed kitchen through French windows and again, access to the living room from the kitchen. The utility room is off the living room. There are varying levels throughout the ground floor by one step. This part is too sad for me to recall, so you'll forgive me if I don't enter into the spirit of this section. Sorry!! All bedrooms have their own bathrooms. Including toilet, hand basin and shower, fitted mirrors with electric point for hairdryer and shavers, all with over head illumination. There is a separate WC with hand basin on the ground floor. situated on the outskirts of Ste. Suzanne sur vire a tiny village set by the River Vire. Peaceful and traditional, with the main attraction being the church at the centre of village life. Linen is included in the rental cost. There is a second TV in the dining room for viewing DVD's only. Small but varied entertainment collection of DVD's. (2) Seating, tables and brollies supplied. There is a day time concierge available between the hours of 12- 5 pm. Please address any concerns to this person within the time frame quoted. Any Out of Hours notifications will be dealt with the following day between the hours quoted. Close to all Normandy Landing beaches. River 15 mins walk. Right in the middle of the countryside of Normandy excellent for cycling, walking, horseriding.and as above sightseeing. Fees for pets, cleaning, are payable in cash on arrival. Cleaning fee is obligatory.